The Trust has for sale a series of three limited edition prints created by artist Stefan Martin exclusively for the Trust in 1984, ten years prior to his death. Each engraving highlights an object of the Trust's preservation efforts. 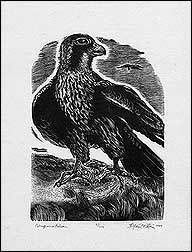 The first is of the "Peregrine Falcon," representative of those species of wildlife which are threatened yet can be restored through stewardship. 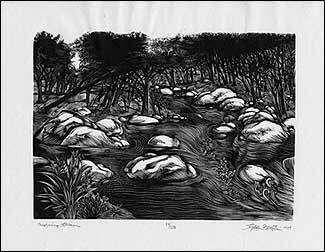 The second engraving, "Morning Stream," typifies a northern New Jersey stream habitat and symbolizes the New Jersey Natural Lands Trust as a vital force in the pursuit of habitat preservation. 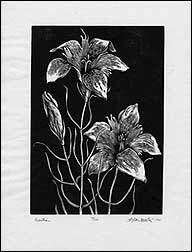 The third engraving, "Gentian," features a grouping of three delicate, beautiful and rare Pine Barrens gentians, one of a number of wildflower species that are vanishing due to loss and neglect of habitat. It is the Trust's resolve to preserve habitat for Pine Barrens gentian and other imperiled species. Artist Stefan Martin earned worldwide recognition for his mastery of the exacting art of end-grain wood engraving. His much admired prints and incised paintings are in private collections and museums around the world, including the Metropolitan Museum of Art, the Smithsonian Institution, the Boston Museum of Fine Arts, and the Chicago Art Institute, among many others. The artist lived and worked in Roosevelt, New Jersey. We are selling the unframed prints for $150 each, or $400 for all three. Remaining as of this writing are 203 "Peregrine Falcon," 131 "Morning Stream" and 20 "Gentian" prints. To order Stefan Martin print(s), contact the Trust and let us know which print or prints you would like to order, your name and phone number, and we will get back to you with ordering details. Please contact us prior to sending a check to be sure that the print or prints that you want are still available. The proceeds from the sale of these prints will further the NJ Natural Lands Trust's preservation efforts. The Trust thanks you for your support in this fundraising campaign.